If you went to the Livable Forums event, you had a lot to absorb even without a full slate of candidates. Trying to summarize it all while dealing with my neck pain is a thankless job(my neck is not going to thank me for this), but it had to be done. 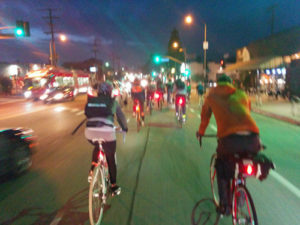 Thanks to Don Ward of Wolfpack Hustle lore for putting a pre-ride together from Sunset Triangle. 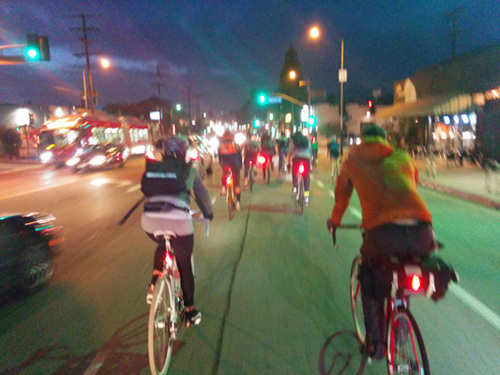 I’m not as comfortable riding at night time, but riding in big groups is a very pleasant experience. Plus, I got a t-shirt too! The crowd was probably around 200. They were very well behaved except for one moment. I tried clapping, but it just hurt my neck. All the candidates supported option 3(bike lanes!) for the Hyperion Bridge redo, although a couple of them seemed like they were copying other’s responses without knowing what it meant. There was a couple lightning rounds where everyone could answer “No” or “Go” to bike lanes along specific streets. There was very little valley talk, but all supported bike lanes on Lankershim. And big thanks to LACBC, Los Angeles Walks and Streetsblog LA for putting on this event in such a setting at the Hollywood United Methodist Church. The interior was beautifully distracting. As for the candidates, you had to read between what they were saying and what they believed. The connectivity between the two varied greatly from candidate to candidate. I think they all believe that LA has to be more street friendly for all people who walk or bike, but not all of them understand the reasoning behind it. Sheila Irani: By far the most knowledgable on transit issues and sounded like the most trustworthy candidate there. 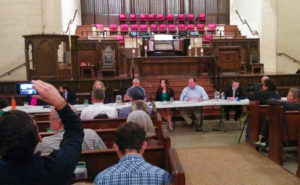 Even when she disagreed with the Cahuegna Pass bike lanes, I agreed with her reasoning that regular bike lanes would be insufficient and something requiring more infrastructure, like a bridge or tunnel would have to be added. Rostom “Ross” Sarkissian: After a night of questioning, I did not really get a feel for him. He was against the Hillhurst bike lanes because the locals he’s heard from think they would be too dangerous. Um…how bad is it now? Also, saying that decisions would be based on metrics makes it sound like numbers could be used as excuses. Carolyn Ramsay: My vibe is that she’s a Tom LaBonge 2.0. Maybe a bike more bike savvy than him, but not a game changer. She wanted bike lanes on Sunset over Hollywood Blvd., but didn’t quite put together good logic why. Tomas O’Grady: Definitely a shot of hot coffee. He’s strongly pro bike lanes. I think he passed on one question in lightning round because he didn’t know the parameters(I was sitting midway back). I don’t think he’s as knowledgable as Irani on this front, but he seems to be the most excitable. Tara Bannister: She said yes to all bike lanes, but I might question her resolve and understanding. In her closing statements, she wanted to bring LA’s streets back to where they were twenty years ago. I didn’t know we were safer in 1995 than we were now. Riding out on Hollywood Blvd. Steve Veres: He probably said no most to bike lanes when the lightning rounds happened. I don’t think he’s a curmudgeon, but he gave a pragmatist response from his position of knowledge. When he referred that this may be a thirty year project, it doesn’t sound like he’ll be the champion of great streets. Fred Mariscal: He supported bike lanes in all cases, but seemed lukewarm in his opinions. When you believe that you have to see as it goes, then that doesn’t instill confidence that you’re behind reworking our streets. I also learned he has a dog. Mike Schaefer: Schaefer has the most experience of all the candidates(he brought it up, not me). He goes with the slogan “Safer with Schaefer”. With all this in his arsenal, I still don’t know if he truly understands safe streets. He brought up there’s people cycling all over in San Diego(where he was a councilman), but I have no idea what he had to do with it. He also said he’d hire a staffer who’d have to bike to work so he could tell him about it. So there’s that. These are my quick reads here. I encourage people to read the LACBC voter surveys to get a better feel on the candidates, as well as checking out the remaining debates. Just remember to get out there and bike the vote! Give me credit for trying to do a good job without being too much of a pain in the neck. Ouch!